The New York Yankees are giving fans plenty of reasons to head out the ballpark this season, with 25 promotional days scheduled at Yankee Stadium. From Mariano Rivera bobbleheads to logo sweatshirts to a chance to see stars from the past, the Yankees have promotions that may be too good to pass up. 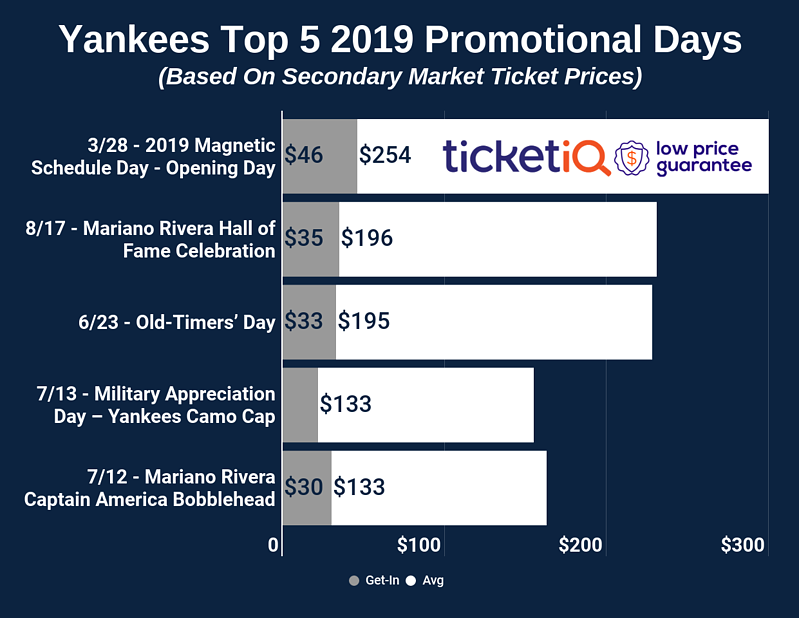 According to secondary ticket marketplace TicketIQ.com, the average asking price for a ticket to Yankee Stadium for 2019 is $125. Promotional nights are averaging $122, though Opening Day, on which the team will give away magnetic schedules, is among six that will cost fans more than the $122 average. If you’re trying to figure which days to go out the ballpark this season, below is a list of giveaways and special events that might help you to make that decision. The Yankees open the 2019 season hosting Baltimore, and all guests will get a free magnetic calendar. The average asking price for this game is $254, which is more than double both the season average and promotional game average on the secondary market. For the last game of the Orioles’ series, the first 40,000 fans to get into the stadium will receive a color Yankees wall calendar. The Yankees will celebrate five-time All-Star centerfielder Bernie Williams by giving bobbleheads to the first 18,000 fans into the stadium in this game against the White Sox. Williams played his whole career in New York and won four World Series. The first 40,000 fans into the stadium will receive a free tote bag in this game against the Kansas City Royals. A six-time All-Star, Sabathia is still in the Yankees rotation and will be honored with a Star Wars-themed bobblehead in this game against the Minnesota Twins. Sabathia won the Cy Young in 2007, and a World Series ring in 2009. It’s been 20 years since the Bronx Bombers beat the Atlanta Braves in four games in the 1999 World Series, and the first 10,000 guests, aged 14 or younger, will get a bat to remember that series. The Yankees have won 27 World Series, the last in 2009. For those needing a little pick-me-up after the game, the Yankees are giving away Dunkin’ gift cards to the first 18,000 fans aged 21 or older in this game against the Seattle Mariners, which, ironically, is the birthplace of Dunkin’ competitor Starbucks. This giveaway is the 14th in a series and the first 18,000 fans aged 14 and younger will get a die-cast metal collectible truck in this game against the Tampa Bay Rays. The first 10,000 fans aged 14-and-under will get a Yankees logo arm sleeve when New York hosts the Tampa Bay Rays. The Yankees will celebrate slugger Giancarlo Stanton, who’s playing in his second season in pinstripes. The first 18,000 fans into the stadium for this game against the San Diego Padres will take home a bobblehead. Fans wanting to add to their Yankees cap collection should mark this date on their calendar. The first 18,000 fans for this game against the Tampa Bay Rays will get Yankees headgear. When the Houston Astros come to town, the Yankees will give the first 18,000 fans over the age of 21 a logo coffee mug to remember the game by. The average asking price for this game is $125, equal to the average asking price for the season, but higher than the $122 average asking price for promotional games. A celebration of days gone by, the team will bring back stars from the past, and host an introduction and old-timers game before the first pitch of against the Astros. The roster of players hasn’t been announced yet, but last year, Andy Pettitte and Jason Giambi were among the former stars to attend. Tickets for this game are trending at $195 on the secondary market, well above the $125 season average. The first 40,000 fans into the stadium for this game against the Toronto Blue Jays will get a post commemorating 100 years of Yankees baseball. The first player ever to be unanimously voted into the Hall of Fame, this is the first of two nights honoring the Yankees’ star closer. The first 18,000 guests to the game against the Toronto Blue Jays will get a bobblehead. Tickets to the game are trending at $133 on the secondary market. Part of a larger MLB initiative and promotion, the Yankees will honor members of the military in this game against the Toronto Blue Jays. The first 18,000 fans (21 and older) into the stadium will receive a Yankees-logo camo baseball cap. The average asking price for this game is $133 on the secondary market. A five-time All-Star, David Cone led the Yankees to four World Series between 1996-2000. A vibrant personality on the field and off, Cone is now the Yankees color commentator. The first 18,000 fans into the stadium for this game against Tampa Bay will get a bobblehead. The first 25,000 guests to walk into Yankee Stadium for this game against the Colorado Rockies will get a collectible cup with a Yankees logo. The $122 average asking price on the secondary market is equal to the season average for promotional games. Anyone with a ticket to this game against the Colorado Rockies will get a Yankees baseball card pack to take home. This is a great day to bring your kids to the ballpark – and to arrive early. The first 10,000 fans under the age of 14 will receive a free Yankees-themed poster before this game against AL East rivals Baltimore. The second of two nights celebrating the Yankees’ storied closer, the average asking price for a ticket to this game against the Cleveland Indians is $196. Rivera will have been inducted into the HOF in July and the Yankees are planning a special program in honor of his induction. Ever want a World Series ring of your own? The first 10,000 fans aged 14 or less will get a replica 2009 Yankees World Series ring before this game against the Cleveland Indians. That World Series win was one of 27 for the Bronx Bombers. Gleyber Torres made his MLB and Yankees debut last spring, but the team is so excited about the talented second baseman/shortstop, that it is honoring him with a bobblehead for this game against the Oakland Athletics. Free to the first 18,000 guests. As the weather cools down, the Yankees are happy to outfit the first 18,000 fans into the stadium with a navy blue lightweight hoodie featuring the team logo across the front. The Yankees will play the Oakland Athletics. Should the Yankees be heading to the playoffs, fans won’t want to miss the chance to get a warm knit cap with the team logo on it before this game against the Toronto Blue Jays. This giveaway is available to the first 18,000 fans to enter Yankee Stadium.